The current plan is to drive to Keswick, but the road was destroyed in the December floods and may still be impassible by April. The detour via the Kirkstone Pass is very long, so we may substitute a different walk. We will depart after breakfast at about 0900. If we can get through, the walk starts at the NT Great Wood car park, which is close to Derwent Water on the Borrowdale side of Keswick. The drive is about 18 miles, and is likely to take about 45 minutes. For those displaying a National Trust badge parking is free, but others have to pay. We hope to be walking by 1000. We will start walking when everyone has arrived. The walk starts with a significant hill which is rough under foot, but soon gets easier. 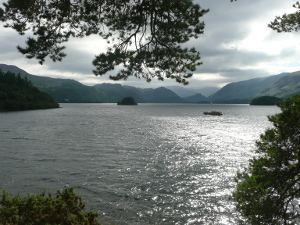 From the top there are good views over Derwent Water. We then have an easy descent to the lake side, but on the way we have an optional ascent to a wonderful viewpoint. It is steep and rough, and you have to come back down the same way, so only the sure-footed should try it. At the lake side there are toilets and a café. We then follow the shore of the lake, before turning inland to return to the car park. Click for a map of the walk. There is a café at the lake side, where there is also a large car park. There are several pubs and cafés in Keswick, but parking is difficult, so you would probably do better to park in the lake side car park and walk to town via the park. Alternatively, you will probably be able to find somewhere to eat wherever you decide to spend the afternoon. We have made no specific plans for Tuesday afternoon. You can find ideas by clicking the Afternoons button. Dinner will be at 1845, followed by ????? ?.